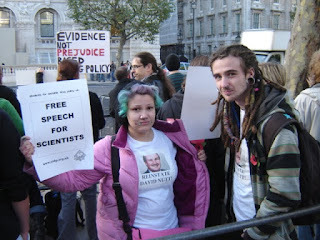 Back in July I blogged about my trip to London to hear David Nutt deliver the Eve Saville Lecture at the excellent Centre for Crime and Justice Studies. Last week an edited version of his paper Estimating drug harms: a risky business was published. 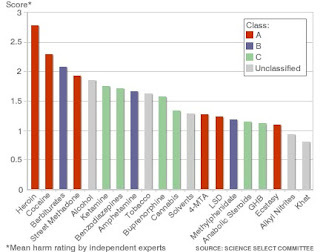 This shows clearly that the claim that drug classification is anything to with harm is nonsense. Despite having demonstrated the nonsense of drug policy Nutt was appointed as Chair of the Advisory Committee on the Misuse of Drugs (ACMD) effectively making the Government's chief advisor on drug policy. Not surprisingly Nutt tried to advise the Government to move towards an evidence based policy and to sort out the mess of the classification system. This was too much for Home Secretary Alan Johnson who following the publication of the Eve Saville Lecture last week sacked Nutt. Much though I respect David Nutt I thought he was wrong as the classification system needs abolishing not reforming. This case has been made powerfully by Steve Rolles in an article The ABC of UK drug classification - not fit for purpose (pages 7-9). Essentially classification links criminal sanctions to 'harmfulness'. This presumes that criminal justice is the most appropriate method for managing drugs potential harm. This approach has clearly failed with drug use increasing, availability widening, and price falling since it was introduced. It has also seen incentives on producers to produce stronger products and dealers to mix all sort of (often dangerous) rubbish with the product. I suspect that although Nutt was an irritant to Government whilst he was an advisor, insisting on telling them truths they really didn't want to hear he will be a more substantial critic now he has been sacked. Freed from the ACMD and its role in the classification system he will now be able to look at wider drug policy and use his expertise to critique drug policy in far more detail. His sacking is likely to prove a massive mistake for government. barbiturates and methadone. Tobacco is ranked ninth"
themselves in fear of losing their jobs.